Urga is a 1991 film by Russian director Nikita Mikhalkov. It was released in North America as Close to Eden. It depicts the friendship between a Russian truck driver and a Mongolian shepherd in Inner Mongolia. The film was an international co-production between companies based in Russia and France. A Mongolian shepherd Gombo lives in a yurt in Inner Mongolia with his wife, three children, and mother. They are portrayed as unsophisticated and traditional people. Gombo desires relations with his wife, to try for a fourth child, which puts his wife at unease due to Chinese law. Sergei, an intoxicated, buffoonish Russian truck driver, has stranded himself by driving his truck into a river, and is picked up by Gombo, taken to his family's yurt, to join him in dinner. Gombo's family are particularly taken with Sergei's back tattoos, later revealed to be music notation for the popular waltz, "On the Hills of Manchuria". Gombo and Sergei become mutually dependent despite their language and cultural differences. Gombo and Sergei go into the nearest city together, where Gombo is supposed to buy contraceptives (condoms); buying a television set and other goods, but not contraceptives due to the drugstore staff being women. Sergei, a former army bandsman, becomes drunk and sings "On the Hills of Manchuria" in a nightclub, with the band playing from tattoos on his back. He is arrested and bailed out of jail by Gombo. Gombo returns home, and along the way stops to eat. He has a strange dream featuring his drunken, horseback-riding relative as Genghis Khan and his wife as the Khan's wife. In the dream both he and Sergei are captured and killed and the TV set is destroyed. Gombo awakes from his dream and arrives home with the TV. He and his family switch between watching a broadcast of the President of the USA and a badly sung variety show. Gombo's wife, although saddened when learning that he bought no contraceptives, leaves the yurt, inviting him to follow her with a gesture. Gombo follows her out onto the prairie, sticking an urga (a long stick with a lasso on the end used to capture animals) into the ground in a traditional signal that a couple is being intimate. A voiceover from Gombo's fourth son, who was conceived at this time, concludes the film, and a chimney belching smoke stands where Gombo placed his urga. Urga won the Golden Lion at the Venice Film Festival and Best European Film at the European Film Awards. It was also nominated for an Academy Award for Best Foreign Film, and for a Golden Globe in the same category. 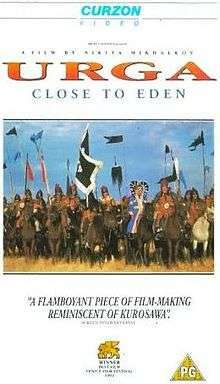 The film is credited with sparking Czech writer Petra Hůlová's initial interest in Mongolia, leading to study, then an exchange year in Ulan Bator, and then to her first novel, Paměť mojí babičce (2002; literally "in memory of my grandmother"), in English translation published as All This Belongs to Me (2009, Northwestern University Press). ↑ Allen, Lisette, "Telling a foreign tale in a foreign tongue" Archived August 5, 2011, at the Wayback Machine., Prague Post, September 30, 2009. Retrieved 2011-06-27.